It’s a process that goes by many names. Project-Based Learning, Personal Interest Projects, Inquiry-Based Projects, Active Exploration Projects… Genius Hour! 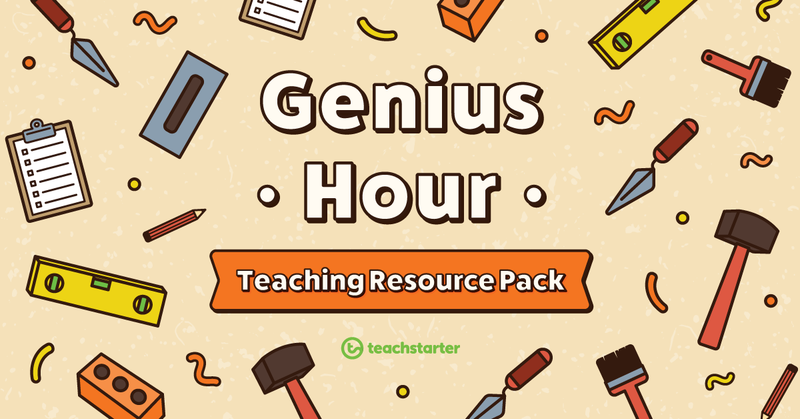 For our brand new collection of student-driven project work resources, we’ve decided to go with Genius Hour. It’s fun, it’s catchy and it positions students in a wonderfully empowered way. When participating in Genius Hour, through the study of an area of passion, every student can be a genius! 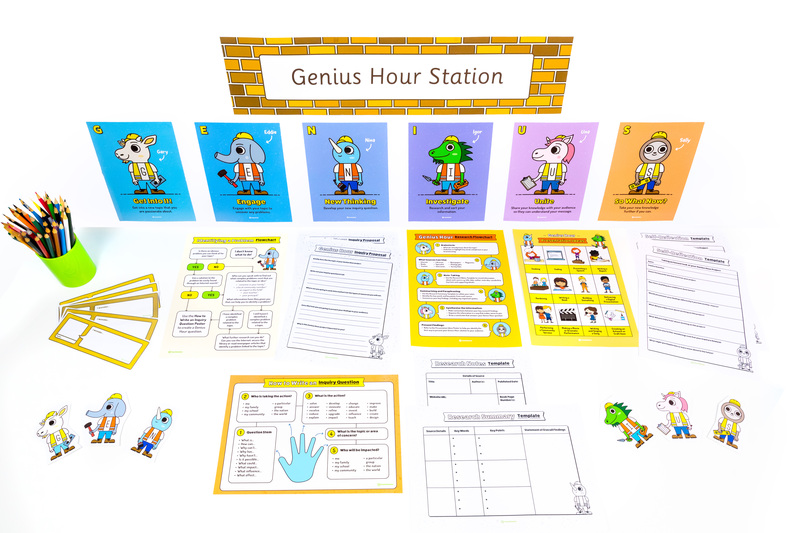 Our brand new Genius Hour Teaching Resource Pack has been a little while in the making. We are so excited to say that’s it’s finally ready for you to download, print and go! Genius Hour allows students to work on a passion project, idea or new skill during class time. Genius Hour projects can be completed during a designated amount of learning time on a regular basis (such as one hour per week), or as a fast finisher activity. During Genius Hour, students identify a topic or problem they are passionate about and form a deep, open-ended inquiry question to research, answer or solve. Students take a systematic approach to the formulation of their inquiry question and research. Towards the end of their project, students present or create a final product that communicates their findings and/or solution. Genius Hour presentations can take a variety of written, spoken or visual forms, such as a multi-modal presentation, a book, a script, a movie or a speech; through cooking, building or performing a community service (amongst other ideas). To conclude a Genius Hour project, students reflect on their experience of the inquiry-based learning process. They may even form new questions that could be answered in subsequent Genius Hour projects. How can teachers ensure that kids don’t just equate Genius Hour with free time?! It is SO important that you take the time to introduce Genius Hour to your students as an open-ended but systematic process. Parents, colleagues and administrators will sometimes also benefit from your being able to explain that Genius Hour isn’t just a ‘free for all’, but a structured inquiry-based learning process in which students will practise a multitude of important academic and social skills. The clearly structured six-step process we’ve developed will help you to explain this to your students, and the wider school community. Not only that, but within the Genius Hour Resource Pack, you’ll find teacher notes, a PowerPoint presentation and a parent letter that can support your communication about the value of the Genius Hour process. How Does this 6-Step Genius Hour Process Work? 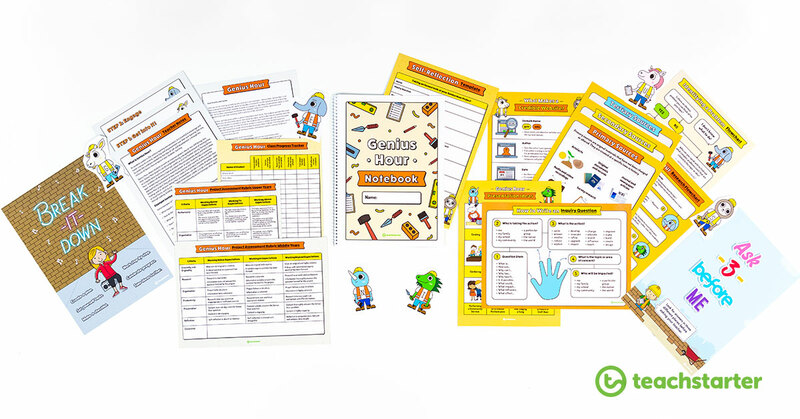 Our resource pack breaks the Genius Hour process into six sequential steps, facilitated in a way that is easy for students to understand what they need to do. 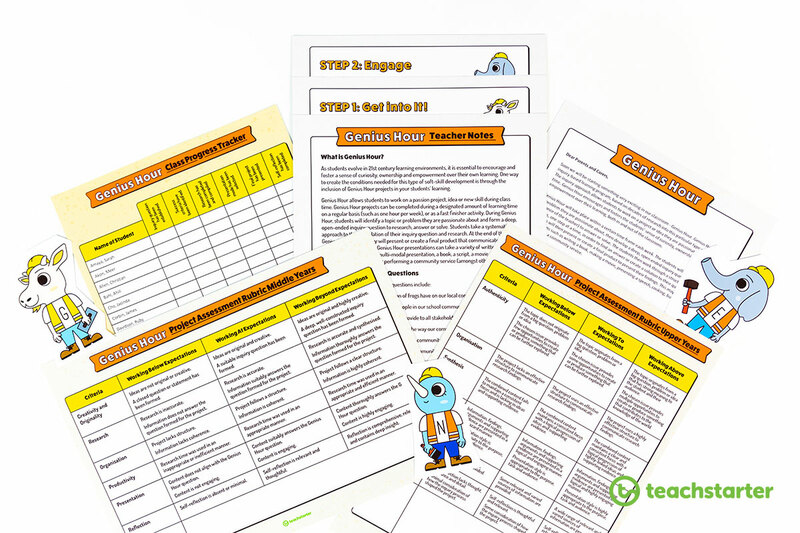 Each step has a ridiculously awesome character that goes with it, as well as a host of resources to support both teachers and students throughout each step. We have thought really carefully about the sequence of student actions and the resources that are used at each step. One of the biggest sequencing ‘issues’ to be aware of, is ensuring students don’t begin Genius Hour by deciding on how they are going to present their project! Students must develop an inquiry question and complete research before deciding upon the best mode for presenting their findings. Follow the Genius Hour Teacher Notes to help ensure your students progress through the six steps systematically in order to get the most out of their Genius Hour project. In this step, students learn what Genius Hour is and begin thinking about topics or areas they are curious or passionate about. We’ve provided Genius Hour Teacher Notes, a set of posters that explain the 6 Steps to Genius Hour, resources to help you create a Wonder Wall Brainstorming Display, an editable Genius Hour Parent Information Letter and an Introduction to Genius Hour PowerPoint Presentation to use in this step. It’s a great idea to set up a Genius Hour Station at the beginning of the process. This is where you can display relevant posters, and provide students with access to all of the different handouts and notes they may need. Making these things available to students from the outset, ensures they can grab what they need without asking you – even if they are at a different step to their peers. This encourages autonomy and increases student accountability! Students also set up their project books during this step. 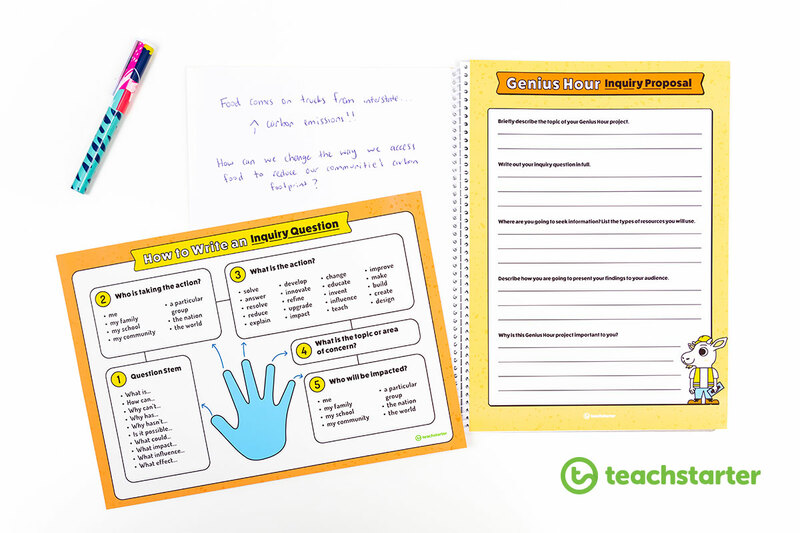 Using the Genius Hour Notebook Template in Full Size or the Genius Hour Notebook Template in Half Size, students can use a lined notebook or blank artist’s notebook to keep track of all of their thoughts, ideas, handouts, research notes and progress through the Genius Hour process. In step two, students engage more deeply with their selected topic and are supported in moving from a broad topic to a more refined area of study that is suitable for a Genius Hour project. Helping students to understand that they can’t just do a Genius Hour project on dogs, without identifying a more complex problem to research or solve can be tricky. This Identifying a Genius Hour Problem Flowchart will help students move from a broad topic (like ‘dogs’) to an identifiable problem (like ‘why are there so many stray dogs in our community?’). This step is one of the most challenging and important steps in the Genius Hour process! In order to progress with a research topic that provides suitable scope and depth, students need to formulate a deep, open-ended inquiry question. The most simple way to explain this is by telling students they need to come up with a question that cannot be answered easily by an internet search. You may have heard the term “un-Googleable question” – that’s exactly what each student needs to create! To help your students formulate a suitably un-Googlable inquiry question, we’ve created a framework that clearly illustrates the five parts that make a great inquiry question. You can display this How to Write an Inquiry Question poster at your Genius Hour Station, as well as providing students with a black and white copy they can glue into their notebooks to refer to. After developing their question, students complete the Genius Hour Proposal Template and conference with you to ensure they are on the right track. The Genius Hour Class Progress Tracker will help you to monitor where each student is at. Here is where students will complete the research they need to answer or solve their Genius Hour inquiry question. We have provided a host of different resources to support this step of the process. If research is new to your students, or your class need a refresher, you may like to use the step four resources to explicitly teach the research process and research skills. The research notes and research summary templates are also available as editable MS Word files for students who are working digitally. We think that Una the Unicorn represents the kind of creativity that all Genius Hour projects need so we just HAD to include her in our Genius Hour characters! When students have completed their research and have a clearer idea of the answers or solutions they need to communicate to their audience, they can select a presentation mode. This is a wonderfully exciting step as the findings of a Genius Hour project can be presented in so many ways! A student who has researched the number of carbon emissions generated by trucking interstate produce to their local supermarket may plan and plant a vegetable garden with signage or posters explaining permaculture techniques, seasonal planting and the projected carbon emission savings that household or community vegetable gardens contribute to. A student who has examined the challenges faced by newly settled refugee children might write a script that shows what students can do to help make new students from refugee backgrounds feel like they belong at school. A student who has looked into the way natural disasters have impacted the global community might prepare a digital presentation that outlines their findings and urges government leaders to take specific actions to curb future negative impacts. The way in which students present their Genius Hour findings and solutions can be many and varied. If you and your school community have the means to support it, encourage your students to think out of the box when it comes to how they can ‘unite’ their message with the audience who needs to hear it. 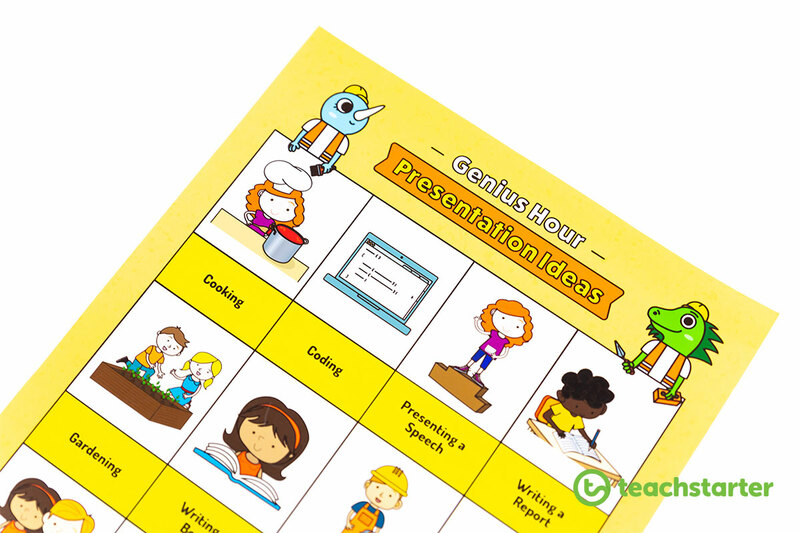 Use the Genius Hour Presentation Ideas poster to help your students think outside the square. After presenting, students take some time to reflect upon their Genius Hour process using the Genius Hour Self-Reflection Template. They articulate their key learning, consider how they could improve their own work and reflect upon new ideas inspired by the experience of their Genius Hour process. 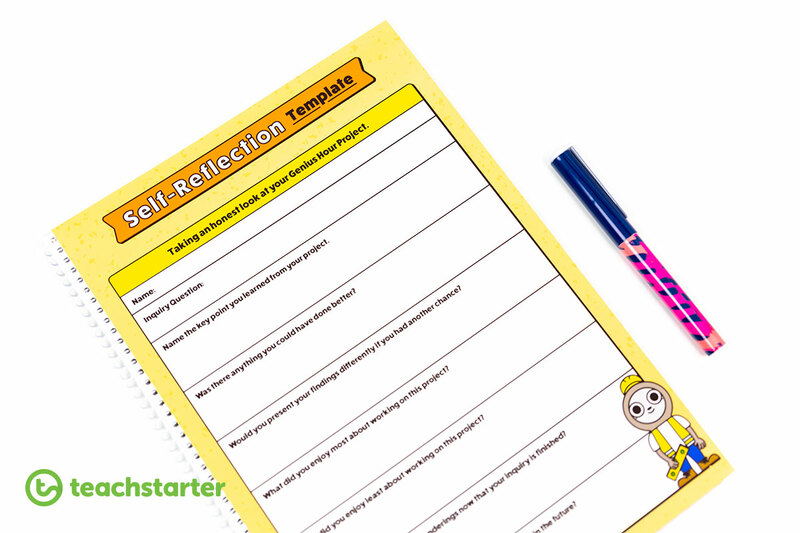 This reflection may generate new questions that students may want to explore in subsequent Genius Hour projects! Some teachers assess Genius Hour, while others do not! It is really up to you and your school to decide whether Genius Hour forms a part of your students’ formal assessment activities. taking responsibility by initiating interactions with others. We have created two generic marking rubrics that you can use to guide your assessment of Genius Hour. These templates are available in PDF form and as editable MS Word documents, giving you the flexibility you need to adapt the rubric to your needs. 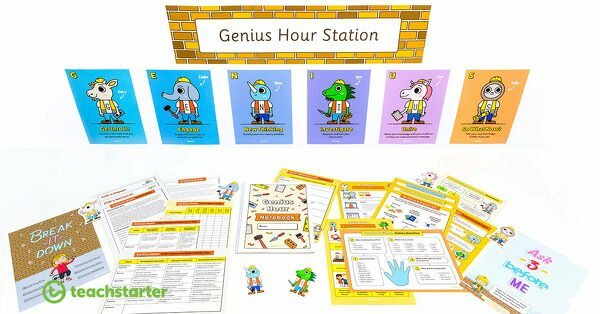 Take a look at the Genius Hour Project Assessment Rubric for Middle Years (Year 3 and 4) and the Genius Hour Project Assessment Rubric for Upper Years (Year 5 and 6). Are You Ready to Try Out Genius Hour? We hope that our new Genius Hour teaching resources make it easier than ever for you to run amazing open-ended, inquiry-based learning projects with your students. As always, your feedback means so much to us and we can’t wait to hear what you think of this new pack! What age group is this resource designed for or best suited to? 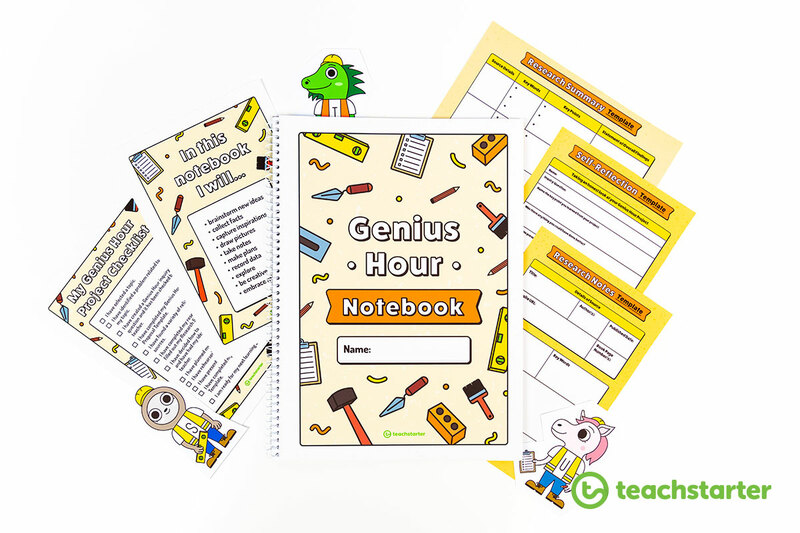 The Genius Hour Teaching Resource Pack is designed for students in Year 3 and above. Year 3 and 4 students could complete the tasks, perhaps with some scaffolding, whilst children in Years 5 and 6 would be fairly independent. Thank you for your question. We hope you and your students enjoy using the resource! I have just introduced Genius Hour to my Year 3 students but they are stuck even to come up with some ideas to investigate? What sort of ideas could you suggest to help me help my student? Thank you for your question. It can be hard for younger students to come up with a topic to investigate but hopefully I can give you some helpful suggestions. 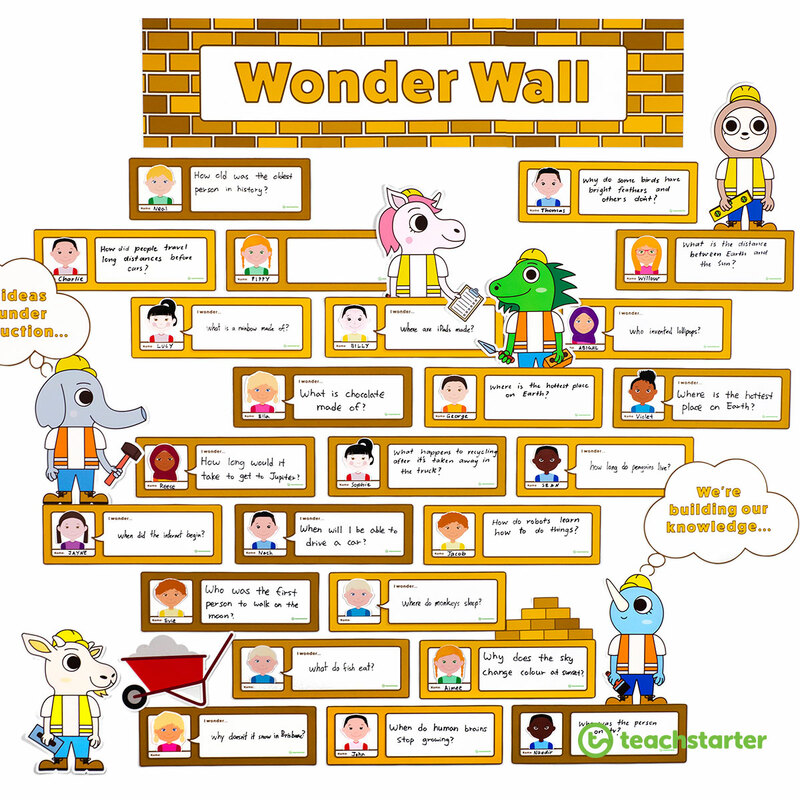 Firstly, the Wonder Wall task is designed to help identify something that the students are passionate about. Have the children ‘think small’ to start with. Ask them what they really like doing at school, at home or on the weekend. I always like to ask the question, “If you didn’t have to come to school today and could do anything you wanted, what would it be?” Remember to allow as much time as it takes for students to identify their passions. As the teacher notes suggest, this may even take a whole term. From there, the students can think of a problem with their interest, or just a way that it could be better, which would then be the basis for their project. 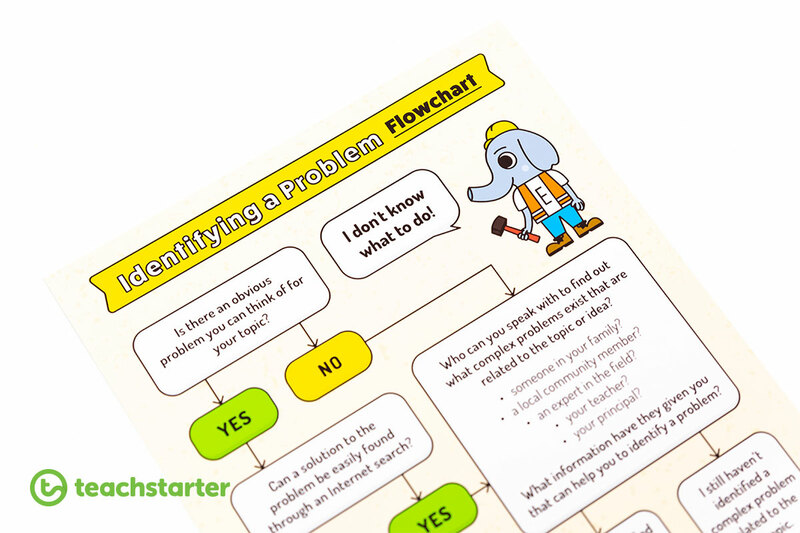 The Identify a Problem Flowchart is very useful in this regard. If you have a student who tells you they don’t like anything, maybe they can identify something they don’t like and then investigate a way to fix it. School based problems (e.g. out of bounds areas, no handball courts) are usually a good place to start with this approach. If all else fails, you could ask the student/s to choose from a list of potential investigation topics that you have curated. I hope that gives you a base to build from. Remember, we’re more than happy to help so do let us know if you have any more questions. i would like to thank you for sharing your hard labour. I liked the idea of exploring students’ interest and passion rather than imposing same old style of teaching. This idea will be great for over active students as well. Thanks for your kind words. We are glad this collection of resources is going to be helpful to you. This one resource is worth the subscription alone! Thank you so much, you have saved me hours and hours of my life.